In-line planer boards are a very effective tool for catching walleyes and trout. In recent years some anglers have been employing boards to catch a variety of other species of fish. On a recent trip to Big Stone Lake on the Minnesota/South Dakota border we caught a bunch of perch in a short period of time, and planer boards were instrumental in our ability to do so. Here’s how we did it. Big Stone Lake is an historic walleye lake, and is also becoming a very good largemouth bass lake. Jumbo perch call Big Stone home too, and they can be caught year ‘round. Big Stone is a great place to go fishing. Tanner Arndt with a typical Big Stone perch taken on a Lucky Shad crankbait. Tanner Arndt grew up on Big Stone. His dad Artie showed Tanner the tricks for catching fish in the lake, and Tanner learned well. He’s a young fishing guide who has a great future in the fishing world. During our recent day on the water, we wanted to catch some perch, and Tanner knew that the best way to do so would be pulling crankbaits behind planer boards. 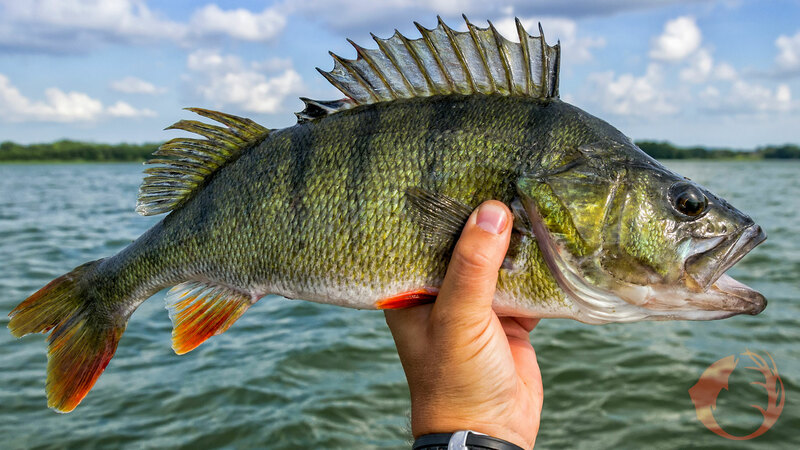 Some anglers choose to anchor and jig vertically for perch, and that works well if there are perch in the area, but much of the time the perch wander, and it works much better to go looking for them. Trolling crankbaits is the best way to do so. We wanted to get as many lines in the water as possible as effectively as possible, and planer boards enabled us to cover a large area of water behind and to the side of the boat. We tied Lucky Shad crankbaits onto our lines. These are really good baits for walleyes, but the perch also like them. We had 4 lines in the water, and all 4 baits were a different color. Sometimes fish will show a color preference, but on this day they didn’t: Every color we tried caught fish. I fished off one side of the boat, Tanner worked the other side. On the first line we set it back far enough so it was working about 2 feet off the bottom. We then attached a board, which took the line out to the side of the boat about 30 feet. The next line was fished directly behind the boat, also about 2 feet off the bottom. The outside lines had boards, the inside lines didn’t. We had our Raymarine Axiom 12 set so the RealVision 3D screen was displayed. This look is unique and revealing. We could see a detailed display of the bottom, and we could see the schools of perch. We knew when we were going to get bit, because every time we saw perch on the screen, about 15 seconds later, when the bait went through them, they hit. There were times when we had 4 fish on at once. Doubles were common. These perch were all different sizes. Some were almost the same size as the Lucky Shad, but we took plenty in the 10-12 inch range. Great table fare. We were using Off Shore in-line planer boards with Tattle Flags. These boards do it all. They’re easy to use, easy to see, they run straight, and the Tattle Flags revealed the lightest of hits. If you haven’t tried in-line planer boards and want to do so, pay special attention to the ones from Off Shore. On this day on Big Stone Lake, we caught a lot of perch in a short period of time. The fight was what you would expect from a 12 inch fish taken on trolling equipment. Not a lot of fight, but a lot of fun, and for most of us, that’s why we go fishing.